Following a series of attacks on the Federal Reserve's rate hike policy and complaints about the strong dollar, some Wall Street observers are saying the possibility that Trump himself will launch a sustained campaign to weaken the dollar as a way to reduce the U.S. trade deficit can no longer be dismissed. While a strong-dollar policy has been a cornerstone for successive U.S. administrations, Trump - like with many other things - has shown a penchant for upending the currency status quo. Since taking office in 2017, he has routinely talked about wanting a weaker dollar to support U.S. manufacturing. Additionally, Trump's administration has been lukewarm toward America’s traditional strong-dollar stance. 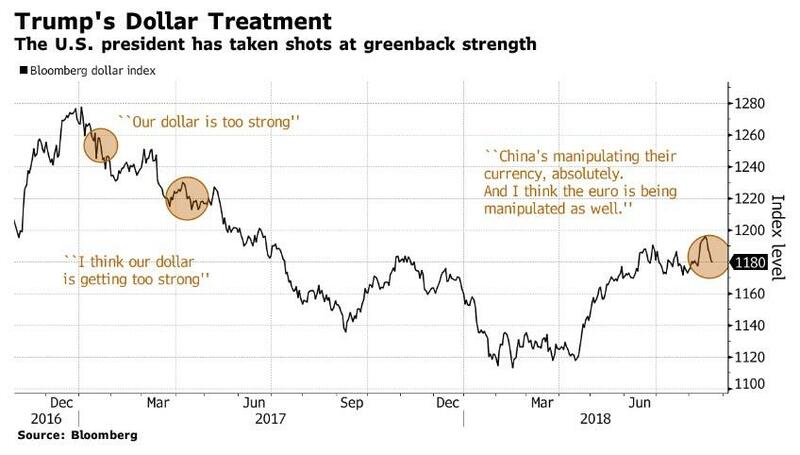 As Bloomberg notes in a Wednesday article, in recent months Trump has further stepped up the rhetoric as the dollar has bounced off its lows. In an interview published by Reuters this week, Trump once again accused China and the European Union of manipulating their currencies. Last Friday, he also complained to wealthy Republican donors that he was “not thrilled” with the Federal Reserve’s interest-rate increases under Chairman Jerome Powell, which have boosted the dollar. As a result, after a flurry of tweets in which Trump complained that the dollar is blunting America’s “competitive edge,” Wall Street has started to pay attention: in a report this month, JPM's chief US economist, Michael Feroli, wrote in a report this month that he can’t rule out the possibility the administration will intervene in the currency markets to weaken the greenback. Both Deutsche Bank and OppenheimerFunds echoed the view, saying dollar intervention was no longer far-fetched. Zach Pandl, co-head of global FX strategy at Goldman Sachs, recently said that "we haven’t had a deliberate effort to weaken the U.S. dollar perhaps since the Plaza Accord in 1985, so it is very unusual and against established practice over the last several decades. A deliberate policy to pursue a weaker currency could cause foreign investors to shy away from U.S. assets -- including Treasury bonds -- raising interest costs for domestic borrowers." In a note from Nomura's Richard Koo, the strategist asks "how President Trump might respond if uncertainty did worsen, raising the likelihood of a slowdown in the US economy" and answers that "one possibility is that the administration would shift from tariffs, which require a separate staff to handle exemption requests for each product category, to the use of exchange rates, which would allow simultaneous adjustments to prices for all imported products." A protectionist policy that must be individually tailored to each product category requires large numbers of administrative staff, and a period must be established during which companies can apply for exemptions. Exchange rate-based adjustments, on the other hand, entail no such costs. In that sense, the more problematic administrative delays become and the more industry opposition mounts, the greater the likelihood that President Trump will replace tariffs with exchange rates as his main tool for addressing US trade imbalances. The loudest warning to date that Trump could rock the currency world has come from Charles Dallara, the former U.S. Treasury official who was one of the architects of the Plaza Accord, the 1985 agreement between the U.S. and four other countries to jointly depreciate the dollar. "The trade debate will increasingly include the currency issues," he told Bloomberg "It’s inevitable." As Bloomberg adds, a shift to a more protectionist and interventionist policy, à la 1985, would not only reverberate across the $5.1 trillion-a-day currency market and undermine the dollar’s status as the world’s reserve currency, but could also weaken demand for U.S. assets. But can Trump really intervene unilaterally in the currency market, and what tools does the president have at his disposal if he wanted to go beyond mere talk? The most direct choice for Trump would be to order the U.S. Treasury (via the New York Fed) to sell dollars and buy currencies like the yen and euro using its Exchange Stabilization Fund, according to Viraj Patel, an FX strategist at ING. But because the fund only holds $22 billion of dollar assets, the impact would likely be minimal. Any direct intervention that is larger and more ambitious in scope would also require congressional approval, he said quoted by Bloomberg. Then there is the nuclear option: according to Patel there is one loophole Trump could exploit to get around the fund’s constraints and bypass Congress altogether: by declaring FX intervention a “national emergency.” He could then force the Fed to use its own account to sell dollars. Such a move would be a long shot by any stretch of the imagination, but with Trump invoking national security to impose tariffs, Patel says he can’t “completely rule out” the possibility. Such a move would certainly roil the market and potentially lead to a USD crash, not only due to Trump's intervention but due to the sudden collapse in faith in the global reserve currency; the result would be a flood of Treasury sales from global custodians around the globe who currently hold over $6 trillion in US Treasuries. To be sure, Trump’s persistent jawboning of the dollar may already be having an adverse effect on foreign demand for U.S. assets. 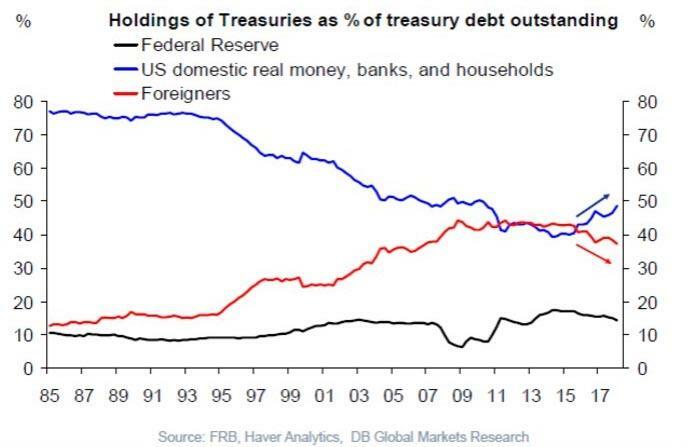 While overall demand at auction has been up and down this year, foreign holdings of Treasuries have slumped to an almost 15-year low of 40%, forcing domestic investors to become the marginal buyer of US Treasurys. China, the largest overseas creditor, has pulled back this year. Japan, the second biggest, has reduced its share to the lowest level since at least 2000. A less extreme, and more plausible, option would be for the Trump administration to include currency clauses in any new trade deals, like it did with the updated U.S.-South Korea trade agreement in March, although enforcement would be complicated and the implementation lengthy. There is also the suggestion of a global accord on currencies, broached in the past by White House trade adviser Peter Navarro, however the chances of a multilateral agreement on the dollar are remote. Plus, there’s always the threat of retaliation by other nations if the U.S. goes it alone. While it remains unclear what Trump will do, keep a close eye on China, where the yuan has tumbled nearly 10% since April, when the trade war with Beijing started in earnest. The magnitude of the decline, the fastest since the 1994 devaluation, boosted speculation the People’s Bank of China is deliberately weakening the yuan to offset the tariff impact. Even though China has denied it is "weaponizing the Yuan", many are skeptical, and Trump is among them: which is why the president has criticized the country for taking advantage of the U.S. by keeping its exchange rate artificially low. (However, Trump has not gone so far as to officially brand China a currency manipulator in the twice-yearly review of international foreign-exchange policies published by the Treasury). Trump's single focus on the Yuan may explain why Beijing has pulled all stops to prevent the currency from sliding below the 'redline' of 7.00 vs the dollar (alternatively it is preparing to devalue further if and when Trump launches the next $250BN in tariffs he has warned he would). Stephen Jen of Eurizon SLJ Capital has warned that Trump may be quick to retaliate in the FX markets if it suspects that China is "playing games with its currency," which may have disastrous effects on demand for U.S. assets. "If you’re an international portfolio manager with 30 percent of your exposure to the U.S., and you know the currency will be guided meaningfully lower as a policy tool, why would you be investing here?” he said. "The Trump administration needs to be very, very careful with its dollar policy." This was most vividly on exhibit during the Fed's QE phase when Guido Mantega, then Brazil's finance minister, siad the Fed was throwing "money from a helicopter" and "melting" the dollar. Ironically, it is the stronger dollar that is crippling emerging markets now. "I’ve lived through a lot of market gyrations in my career,” he said. “And I have an uneasy feeling that I can’t validate by data that tensions are going to, at some point, emerge into volatile market dynamics. This is a risk."